I mean, how long can you really expect Vernon Wells to hit .300 with fantastic power, as was the case this April? How many at-bats can you hand out to Jayson Nix before he becomes overexposed? Great pitching can only carry a team so far. At some point you have to score some runs or those 3-2 victories will start turning into defeats. Just take a look at what the Yankees offense has done this June. Be warned, these numbers aren’t for the weak of heart. This complete lack of production has led to a 11-15 month and it’s brought the Yankees’ run differential into the negative, which is never a good sign for a team with playoff aspirations. Manager Joe Girardi appears to be so fed up with his lack of offensive options that he’s reached the point of throwing anyone out there, just to see who sticks. Girardi and Cashman have already used 23 different position players, trying 6 different players at 1st, 4 at shortstop, and 8 different corner outfielders. 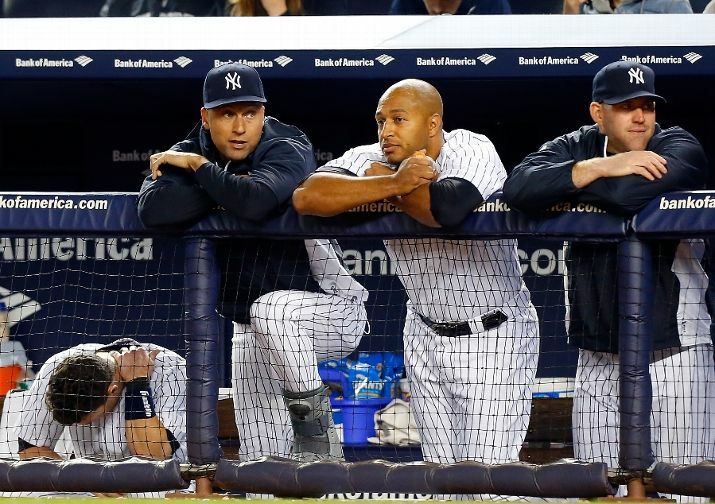 So, aside from pulling his hair out, what can Joe Girardi and Brian Cashman actually do? During the mid-2000’s Vernon Wells was actually a fairly productive player. From 2003 to 2008 he was a .285 hitter who average 25 homers per year for the Blue Jays while picking up a couple of Gold Gloves in the process. Granted, those Blue Jays teams were unable to accomplish much in the win column, but that’s not the point. Wells was still an asset for a ball club to have, one that was good for 3-4 wins above replacement per year. But the last few years haven’t been so kind to Vernon. He’s spent the majority of his time bouncing around from team to team, taking shots like a human pinata almost every where he goes. That’s why April had to feel so phenomenal to the left fielder. He was able to overcome all the negative stigma to post a productive April that included 6 homers, 13 RBI, and a great strikeout to walk ratio. However, since the calendar turned to May the Vernon Wells train has come completely off the tracks. The Yankees nominal left fielder has hit .181/.207/.277 in 179 plate appearances since May 1st, while piling up 31 strikeouts to just 5 walks. Hell, that’s worse than the .205 average Jeff Francoeur just got sent home for. New York can’t continue to throw away at-bats on Wells and if that means cutting him with a year and a half left on his deal, so be it. Shortstop was always going to be a bit of a rough spot for the Yankees, especially with Derek Jeter suffering a setback that will keep him out through the All-Star break. After all, it’s not easy replacing a legend who’s racked up 3304 hits in his career. Even with that in mind, I don’t think the biggest pessimist would have predicted struggles on this level. Other than the Seattle Mariners, no team in baseball has gotten less offensive production out of the shortstop position than the Yankees. Jayson Nix, Eduardo Nunez, and a handful of other players have combined to post a .536 OPS, which is more than 250 points lower than the .791 OPS Jeter put up a year ago at age-38. Nix has at least been able to hold his own with the glove, but it’s still hard to swallow so many easy outs and so many bad at bats. The rest of the left side of the Yankee infield hasn’t been much better either. Thanks to injuries to Alex Rodriguez and Kevin Youkilis, the Yankees have spent a grand total of $40 million dollars on the position this season and they’ve gotten precisely 118 plate appearances, a .219 average, and 2 homers to show for it. That’s left the Yankees with David Adams starting at 3rd, and boy has that been an awful adventure. Adams is hitting .186 with 4 walks and 28 strikeouts in a little over 100 plate appearances and he’s looked woefully over-matched against Major League caliber pitching. There are only 1 or 2 other franchises in baseball that have the type of pitching depth that currently resides within the Yankee organization. Hard-thrower Michael Pineda is scheduled to make his Yankee debut before the month of July is out, and he’s been throwing gas at both of his rehab stops thus far. That spells trouble for one current member of the Yankees rotation and it could also provide a unique opportunity to Brian Cashman. With Phil Hughes and Ivan Nova both struggling to remain consistent, one or the other, could be sent away as part of a package deal to bring back a bat. There are always potential suitors lining up around the block for proven inning eaters in their 20’s. Milwaukee, Chicago, Houston, could all use another young pitcher in their rotation, and all three should be looking to move anything that isn’t nailed down at the deadline. Aramis Ramirez, Alfonso Soriano, Carlos Pena, Nate Schierholtz, and Cody Ransom, among others, should all be made available by their respective teams. If the Yankees really fashion themselves as contenders they absolutely must take advantage of an easy upcoming schedule (11 of their next 15 are against the Twins and Royals). If the Bronx Bombers can’t come up with 9 or 10 wins in that stretch, Cashman may want to go into sell mode. Even if a lineup that includes Curtis Granderson, Alex Rodriguez, and Derek Jeter will score quite a bit more than one that includes the likes of Jayson Nix and Vernon Wells, it’s worth wondering whether or not those players can come back and immediately contribute. Granderson struggled mightily over the last 2 months of the 2012 season, Jeter is 39 and still playing shortstop, and everybody on earth already knows the circus comes to town anytime Rodriguez is around. No matter what happens, the next couple weeks are going to be crucial in New York. Have Pitchers Solved the Josh Hamilton Equation?